This is a surprisingly well-equipped image editor that not only has the tools you've used if you have previously used some of them, but it is even richer than some standard that we meet. This is a completely free, and ask whether the stay. It is very good and simple interface,and everyone would be very easy to make, the basic tools are located on the palette on the left side of the window, while the most interesting options on the toolbar at the top of the window. No matter what would this program, at least by name, could line up in the advanced editors meant something more experienced users, the truth is actually quite different. Tools that offers customized and total beginners, a great number of opportunities utilizable without the need for more specific tuning parameters available. That is possible only with one click optimize color ratio, the level of contrast or brightness, fix exposure, red eye effect from photos to create panoramic, with photos remove various art effects and damage, tighten, resize and rotate, and much more. Since the action easily undone, and all the changes that are doing now, you can see, and only when you are fully satisfied, decide and implement them on the photo with the work. There is Xtreme Photo Designer fairly well equipped. Just choose the only special effect you want. With a lot of other options and tools, which are all well described in a free guide in PDF format that you need from the official Web site to download separately (weighs about a hundred pages, which only confirms that the Xtreme Photo Designer very well equipped). Can be listed and the possibility of recording the contents of the screen, support for scanners and the possibility of optimizing the format, which captures images that would be suitable for display on the Internet. When we talk about formats, there's a surprise, except the typical format, was able to open and record in Photoshop PSD format. Cool. 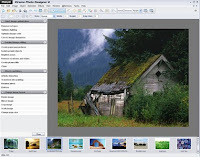 Xtreme Photo Designer really good image editor that will have no problem to meet many home users.